Blankets and Water • Bearded Dragon . org . I have a question, or two rather. Some of you may have seen in a couple other posts that I am new to Bearded dragons and new to this board. I have learned a lot in a short amount of time. I really appreciate everyone here, and all the advice I have been given. My 1st question is about blankets, I see a lot of people saying they have blankets for their dragons. Are these in their terrarium to snuggle with and burry into or is this just for when you are cuddling with your dragon? Is this safe, and if so, what kind of material? My 2nd question is about water. I have seen machines that have plastic plants in them that attach to the side of the cage so that the dragon can lick the water off the leaves. If this okay if it is maintained? Or what do you use? 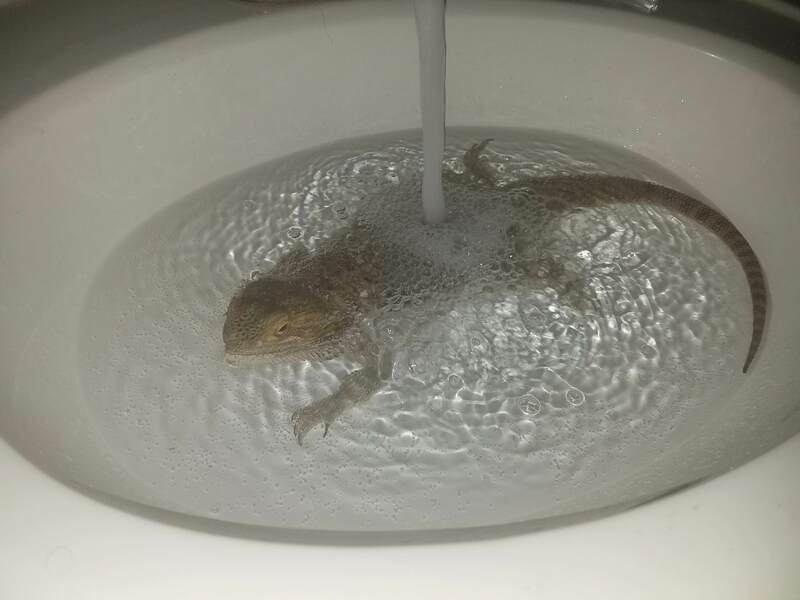 I have been letting my beardie have water in the bath, by dropping it on the end of his nose, or just when I am holding him I will offer water on the end of his nose, and also of course from his greens which he is not fond of. I use a cut up fleece blanket. Mine loves to bury his head in his blanket. Some scraps I use to pick him up & wrap him like a burrito. I have a hammock over his cool corner where his blankets are at. So I have a few pieces hanging down, so technically it’s his blanket cave. As for water, he hates baths, so I give him water from a plastic eye dropper. I had hoped to get some blanket squares or something I could cut for him into little squares but I didn't get a chance this weekend. I love the photo you posted. I have never given mine water that deep. Nice to know yours will standup. Once I put mine in water, and he would lower his head to the water line, and I was nervous he would drown, but maybe he was just drinking the water. I usually give mine a bath about 3 times a week and I check if he would like some water everyday by dropping some droplets on his snout and seeing if he wants to lick it. mine does not always like water but i give her the choice. i fill the bath tub and drape a towel over the side of it. she will climb into teh tub and swim/float around for a while. she will then get tired of it and start swiming/scratching at the sides of the tub. i let her do this untill she makes her way over to the towel and starts to climb up. she will some times sit on the towel and ill turn the lights off as she sleeps semi floating in the water. she will also dive her self down under water from time to time. she has sat under about 7 inches of water for up to 40 seconds before poping her self back up and floating on the surface again. scared the crap out of me the first time she did it but now she will regularly go fully under water for periods. What a cutie you have there. I usually do about 2 inches of water, maybe 3. Does yours actually swim? or just walk around? she will walk around in shallow and in the sink rub her belly on the bottom of hte sink. in deep water she will float and swim, diving here and there but she needs to be in the right mood for it. edit: i assume the video works for you, never tried sharing from google before. yeah, the video worked. I commented on it. She is super cute. I love seeing videos of other Bearded dragons to see how they act and react. I ran home and gave Murphy a bath, he didn't want to drink any water, and pretty much just wanted to sit and relax in the water. I did talk him into swimming to the side, so I did get to see him do that, but he wasn't really in the mood to swim. It made me wonder if he had ever had the chance to swim before. Perhaps at almost 2 years old, he didn't realize he could. It sounds like you have offered Sindragosa a lot of opportunities to have fun! she also comes to the stores/mall with me and to work as well. she gets out quite a bit. also has the entire house to run around in. What do you use to have her travel, like a doggy bag to carry her in? My son and I had been thinking about something that might or might not exist. I bag, like a dog carrier bag with a build in heat pad for our Murphy.